The Sombrero Tower rises above the flat Dillon, South Carolina countryside surrounding South of the Border like the Space Needle rises above Seattle. It signals the end of your journey to America’s Favorite Roadside Attraction. It also signals the beginning of a fun-filled time exploring the numerous shops, arcades, restaurants and stores of South of the Border. 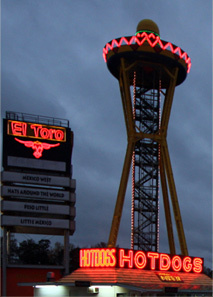 The 200 foot tall Sombrero Tower was considered the World’s Largest Sign until just a few years ago. At night, its neon glow can be seen for many miles up and down Interstate 95, beckoning weary travelers to stop for a much needed break. Recently South of the Border has undergone a multi-million dollar renovation project. The Sombrero Tower’s once vibrant southwest color scheme had become faded after years of rain, snow and blistering summertime South Carolina sun. Some of the neon tubes had lost their luster or had burned out. Pedro has changed all that!! Now its warm orange, yellow and green hues glisten and sparkle in the sunlight. At night, the new neon lights blaze and twinkle in the Dillon night sky like a sombrero-shaped alien spacecraft is about to land on the grounds of South of the Border. During the daytime, The Sombrero Tower’s Observation Deck lets you see the lush green North and South Carolina countryside for long stretches in all directions. As you glide to the top in the glass elevator, you begin to see the grounds of South of the Border from an entirely new angle. The ride is a mere $2 for all of Pedro’s friends. Once you’re high atop the tower you can walk around of the brim of the sombrero for an unobstructed 360 degree view of The Border and beyond. Visitors have taken some amazing photos from high atop The Sombrero Observation Deck. Here, Derek Lee Anderson checks out the lush fields around South of the Border. On the site Panoramio, Starrider99 took this amazing shot from the south side of The Sombrero. You can see the Pedroland Amusement Park on the left side of the photo, and I-95 South on the right side. This video shows a family having a fun day at The Border, and taking a ride to the top. Jacob K. has this shimmering nighttime photo of the neon lights in his Flickr stream, which reminds Pedro of something. You can now follow Pedro on your choice of social media sites. Our official Facebook site can be found here, and Sherry Lynch of the famous radio DJ duo Bob and Sheri created a fantastic fan page. You can follow Pedro on Twitter under the name @SOTBPedro. So next time you come to South of the Border, make the time to enjoy a leisurely trip high above the grounds and enjoy an amazing view of the majestic Carolina countryside. This entry was posted on Monday, January 25th, 2010 at 2:00 am	and is filed under Amusement. You can follow any responses to this entry through the RSS 2.0 feed. You can leave a response, or trackback from your own site. As a child growing up in Dillon County we would visit South of the Border probably more often than most. Whenever we had family come into town this was top priority to come and visit. You can see our farm from the top of the hat! I am very glad to see all the progress and renovations going on! I was very concerned after Patti (who is also my cousin) passed. I don’t have too many contacts their anymore to keep me updated with things going on but it looks like everything is wonderful! Can’t wait to visit soon! 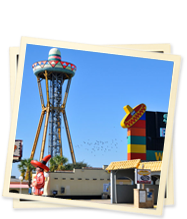 We are RVers and we stop by South of The Border all the time, and with the wmprovements being done it really makes your stay more enjoyable, The Camp ground is superb and with the AARP discount I can’t see why anyone would stay anywhere else. The motorcross park is very cool and I see the train is back in service for rides arouns the park. Thanks to the Grandson who too a family tradition to american fun and has brought it back to life once again. Hi! Does the observation tower close? I am driving through in April and I’d like to go up, but we won’t be arriving until late, probably after 8pm. Will we still be able to get up? I hope to come down one of these days and go up in the Sombrero Tower. It sounds like fun to see just about everything that South of the Border has to offer. It is a great place to stay and I stayed there once on my way down to Florida back in 1980. South of the Border has everything to offer a tourist like me. I have stopped there on way back from Florida back in 1983. It was a great experience to stop at South of the Border. We went June 30th,and had a good time..Until we locked our keys in the car !! Thanks to the 2 guys that helped us and got in !! Having served in the military in South Carolina and Georgia (now retired and living in GA), and being from New York, I have fond memories spanning 33 years! The place was looking pretty run down for a while but it’s looking great now! Just visited this Wednesday heading up to NY and just drove by it on our way home. Me and my son drove 3 hours just to visit SOB. I had been there one time before back in the 80’s. I had always wanted to come back. My son was on vacation so we came up and it got to late to drive back home so we stayed at the South of the border motor inn. A nice place to stay. We will be back again real soon. Wow! When I was a child, my family would stop here every summer on our way to Myrtle Beach for vacation. I have such wonderful memories of the place and now I am planning a stop there with own child. I can only hope that he’ll take away as many happy memories as I did. First time staying at the campground. I must say we were pleasantly surprised on the cleanliness of the facilities and friendliness of the staff. We have a large motor home and are towing a vehicle …… we’re a bit nervous if we could “fit” on a site……we had more than enough room and was an easy pull through. We will be stopping again on the return trip. Thank you.